When you have individual lessons, you develop a close relationship. In music, the teacher becomes the mentor. She knows. She is a singer. In music we have individual lessons. We develop a one-on-one (or one-to-one) relationship with our teachers. It’s like that in doctoral studies, too. I still keep in touch with my piano teacher from Okinawa though it has been decades. Last year my piano teacher at university organised a concert for my piano guitar duo. The same goes for composition. When a composer accepts you as his student, he takes on the responsibility of getting you to compose and develop as a composer. What if you lose interest in composing? What if you stop composing altogether? The teacher would be disappointed surely. Most would give up or lose contact. But we continued to collaborate. It was the first time we had a brass instrument in the Monument House Concert Series. Had he not been ill, he would have served as a panel discussant in the most recent Monument House Concerts. 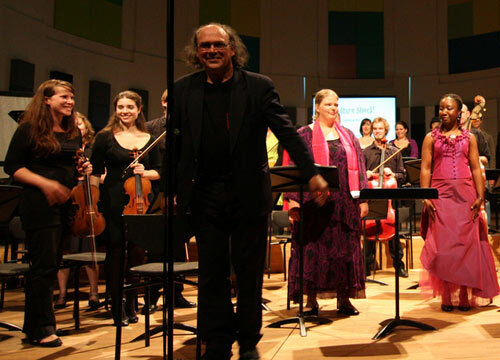 We premiered Henk Alkema’s “Sailor Talk” in Cortona, Italy. We performed it in Amsterdam and La Coruna. We performed and released the CD of the live recording in Maui 2007. The score is now published with Donemus. Henk Alkema, who taught me composition, became a performer in the concerts I organised and a composer of a work I performed. In music, your teacher becomes your mentor. The relationship is life long. When one dies, part of you dies. 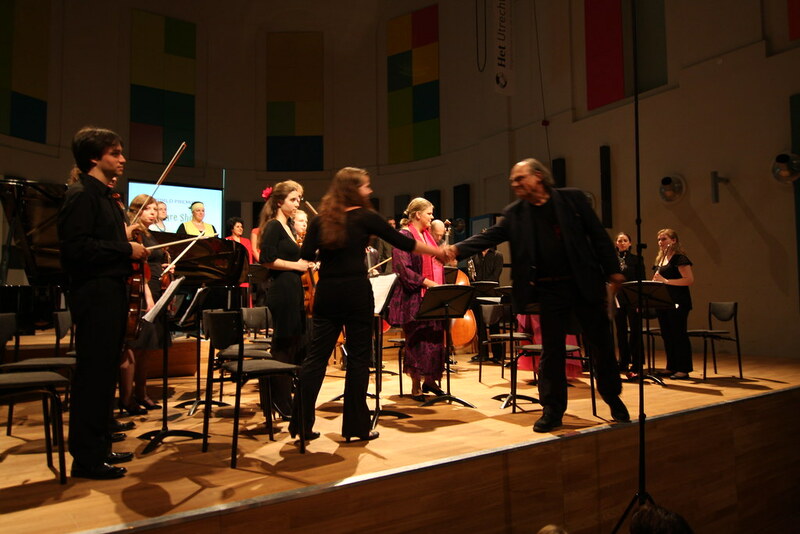 After Henk Alkema retired from Utrecht Conservatory, he continued to volunteer his services, as teacher, conductor, and composer. Below is a clip featuring the Utrecht International Harp Competition. 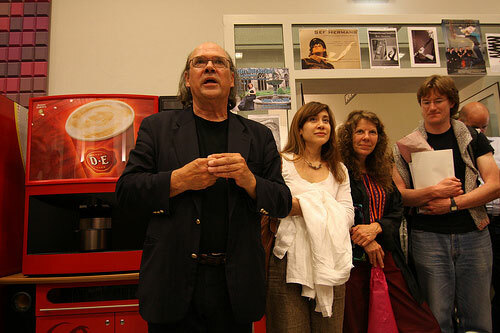 Henk Alkema taught composition at Utrecht Conservatory. One student remembers the early days and the last visit with CD. Since 9 am this morning I have been thirsting for words to inform my musician friends, particularly those non-Dutch classmates who have left the Netherlands, of the sad news. Henk Alkema taught me composition and arranging; conducted my chamber opera in my final exam, delivered the final grade announcement speech, and actively performed and participated in our Monument House Concert Series. I knew he was dying. When the news came, it was too soon. The Dutch press release sent out by his friend Annett Andriesen-Rutter has now reached many Dutch newspapers, radio, and television. The English papers? Not yet. I have often, since my graduation in 2008, regretted not taking advantage of the proximity of Henk’s houseboat to visit him and get coaching on composition. He lived a mere 2 minute cycle ride from my home in Utrecht, Netherlands. The truth is — I stopped composing when I graduated from composition. There was no longer a yearning to compose. The hunger that drove me to apply to study at Utrecht Conservatory where Henk was head of composition in 2004 waned as my interest in chamber music performance and cultural economics ballooned. In January 2004, I began contract lessons with Henk Alkema. He asked me to start from scratch. On alternate weeks, I’d take lessons from the other composition teacher. Their approaches were very different. I blogged about those lessons: food for the soul, composing the Suite Bussum, composing wrong notes, and his honest feedback about my music. The economics of benefit concerts is the subject of another blog. Three benefit concerts in Boston, Amsterdam, and London are taking place this week 30 March – 6 April, showcasing a wide range of talent and genre from classical to rock. 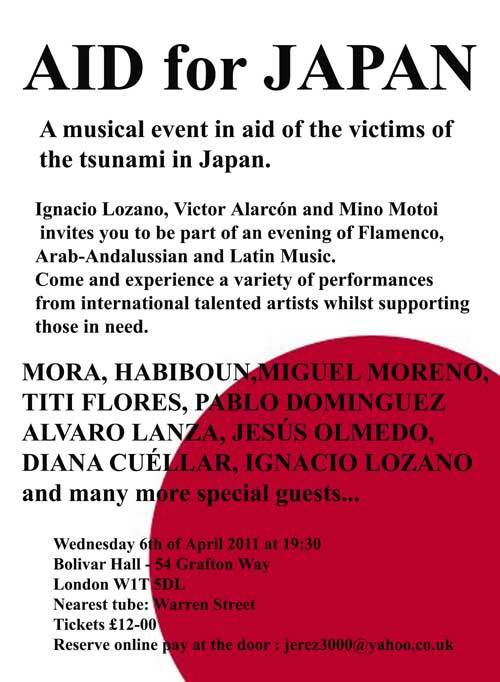 The earthquake and tsunami that devastated northeastern Japan on 11th March 2011 has ignited various fundraising events for the Red Cross and other relief organisations. 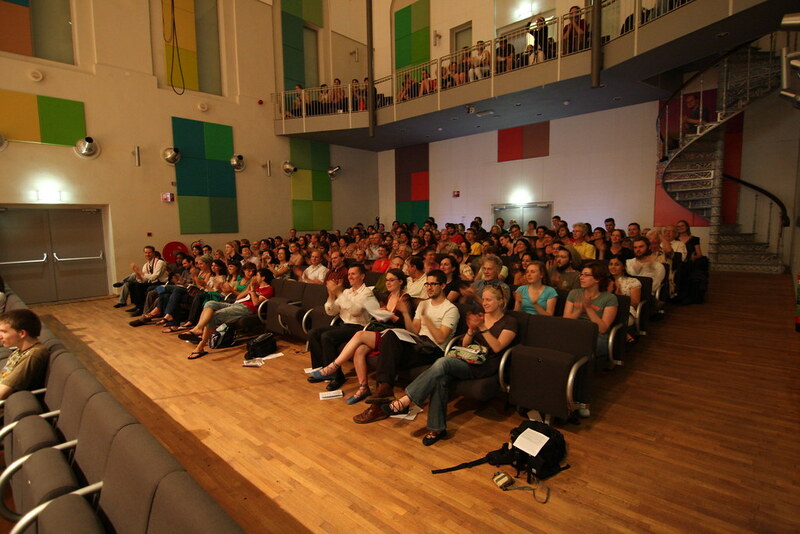 Among them are benefit concerts organised by musicians. At time of writing, I have been notified of three forthcoming benefit concerts for Japan that are initiated and/or given by my musician friends. It’s a brave undertaking that requires extra effort beyond a normal concert. As I am unable to attend any of these concerts due to my current location in Maui, I share these here and invite my readers to pass it on. Linda Kernohan, composer, pianist, organist, and prolific blogger of Miss Music Nerd, will be giving two concerts in Boston. I met Linda at the first concert of 5-week USA tour on 21st October 2010. Her husband had worked in Okinawa, where I spent 11 years of my youth. Since meeting Linda, I have followed her on Twitter and her blog. The concert features herself on the organ together with a host of other musicians, including countertenor Yakov Zamir. 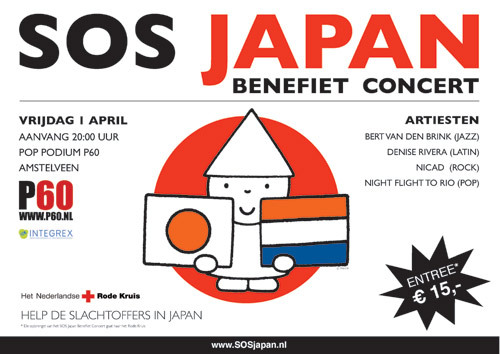 Keiko Kotari, my classmate from Utrecht Conservatory, and her husband Marten Tilstra, both concert pianists initiated this charity pop concert. Keiko was in Kobe when the previous big earthquake hit Japan in 1995. I had immediately assumed when Keiko mentioned her intention to organise a charity concert on the Facebook wall that it would be a classical concert and that she would play. What a surprise to learn last week that it was to be a jazz, latin, rock and pop concert. Tickets are € 15 and can be ordered through the website of P60. The complete revenue of this concert will be donated to the Japanese Red Cross, for immediate relief for the victims in Miyagi prefecture. More info at SOS Japan Website. Algerian singer and artist Houria Niati and her duo Habiboun will be performing in a mega concert featuring many artists of that genre: flamenco, arab-andalucian, and latin music. Tickets are 12 pounds each by reservation or at the door. The economics of benefit concerts is the topic of another blog. Concert production is an activity that involves high transaction costs. Benefit concerts require that extra mile to attract people to come, get people to pay, and generate the income that more than breaks even. One way is to ask musicians give their time and talent (for free or for a reduced fee) while the public (the listeners) pay more than what they would normally pay for such a concert, resulting in above average income for a good cause. For this to work optimally (i.e maximise the funds raised), the venues should have large capacity and need to be filled. Listeners are persuaded to give as much as possible to maximise revenue. Profit maximisation requires not just revenue maximisation but cost minimisation or elimination. In other words, hire the venue for free, get piano tuners to tune without charge, get additional sponsors to defray other production costs, and get all of this done as efficiently as possible.